Okay guys, here’s the game plan: Applejack, you’re going to catch the idiot ball and run with it for as long and as hard as you possibly can. Just before you’re about to get some sense knocked into you, you’re going to buck that ball as hard as you can over to Spike. While all the attention is on you and your spectacular failure, nopony should notice that the ball has changed ownership. Spike, this should buy you that extra time your stubby little legs will need to run with that idiot ball all the way to the goal line. Got it? All right. Break! In the two seconds that Spike’s been in possession of the ball (which took the shape of a surprise day off from having to dote on Twilight), he has managed to get himself lost in the Everfree Forest and nearly eaten by (surprisingly well-animated) Timberwolves. Thankfully for him and for us, Applejack comes to the rescue… and none too soon. With the sound beating poor AJ received last episode from having held onto that idiot ball for so long, it’s good to see her so quickly out from under its deleterious effects and doing what she does best: kicking trees flank and taking names. That, and generally being a sensible, level-headed pony who is quick to lend a helping hoof and quick to forgive a debt. To me, this is Applejack at her best. Kind of a shame our toll for being able to see it is also witnessing Spike at his worst. I will grant Spike this: he’s a dragon of his word. His “Spike the Dragon Code” is something he takes very seriously, and he’s willing to give up his position as Twilight’s assistant to live up to it despite the huge emotional toll he knows it will incur. Twilight’s surprise shipment of books from Princess Celestia distracts her from really listening to Spike try to explain what’s going on, though, so Spike’s disastrous “service” is free to run unabated and pretty much ruin Applejack’s life for a good long while. AJ, for her part, does an admirable job of taking her new-found lifelong servant in stride… at first, anyway. The way she looks around the farm for something, anything for Spike to do and immediately picturing all the things that could go wrong with them is fantastic. Plowing the field? Mud everywhere. Painting a fence? Paint everywhere. Splitting firewood? Blood everywhere. Actually, that five-second scene right there is probably my favorite part of the entire episode: those disastrous outcomes are not actually shown (this is a kids’ show, after all), but they’re heavily implied, immediately understood, and hilariously acknowledged by Applejack’s increasingly fearful vocalizations. 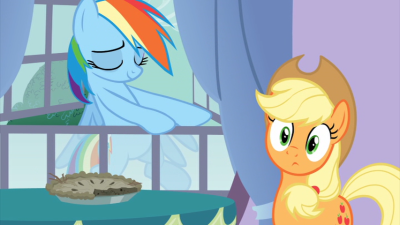 I’d say my second-favorite part of the episode occurs right after Spike brings the “pie” he baked to Rarity and she, Applejack, and Rainbow Dash have a brief dialogue about how awesome it would be to have a servant but how awkward it is that said servant is Spike. It’s a dialogue between friends that I’m sure most of us have had to some extent or another (not so much about a servant but rather the bizarre antics of another mutual friend), so it’s not only relatable but also wonderfully rich with dabs of sarcasm and self-aggrandizement that play to the conversing ponies’ personalities so very well. Honestly, there’s a lot of good character writing going on here: it’s just interrupted by Spike’s ridiculousness at nearly every turn. Also, Rainbow Dash writes fanfic now? Awesome bit of continuity there, and what I suspect could be a subtle nod to the community’s unstoppable deluge of My Little Pony fan fiction. Seriously, it’s insane. I don’t know where we rank in terms of sheer word count when it comes to fan fiction centralized on one particular show, but if we’re not in the top ten I’d be quite surprised. Anyway, Dash offers a reasonable-ish suggestion: tasking Spike with an impossible chore could be an effective way of getting him to give up, or at the very least keep him busy for a while. AJ already kind of tried that with a bowl of eggs on a shelf that was impossibly high for Spike to reach (and we know how that turned out), but Dash is thinking bigger: a huge pile of heavy rocks to smash through! How could he possibly build that in any reasonable amount of time? So if an impossible task doesn’t work, how about Fluttershy’s also-reasonable-ish suggestion of no task at all? It’s only logical that if there is no task that requires assistance, then no assistance can be given, right? Wrong! Spike immediately rips a page from Donald Rumsfeld’s book and begins rattling off a pile of “unknown unknowns” that Applejack might experience at any time, thereby asserting that there’s no possible way he is going to not do things for her. QED. With both extremes of the “how the hay do I get Spike out of my mane” spectrum exhausted, Twilight comes up with an orthogonal plan: get Spike to save AJ’s life, thus canceling out the debt and setting everything right once again. AJ concocts a plan that seems foolproof on paper dirt: get herself attacked by a “Timberwolf” (read: a hastily-constructed puppet), get herself “accidentally” stuck while retreating (read: totally on purpose), and have Spike “free her” (read: pretty much do anything other than not exist) so they’re both able to run to safety. Life save, debt repaid. QED, right back at ya! And it almost worked: Twilight made an A-for-effort puppet, Fluttershy made some pretty realistic Timberwolf trotting noises, and Rainbow Dash made some pretty horrifying Timberwolfy noises (seriously, she must have been a little hoarse after all that roaring… eh? eh?). 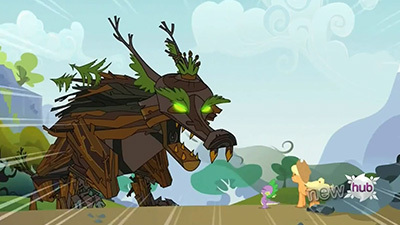 The lack of a wretched stench was the dead giveaway for Spike, though, and just as everypony was about to drop the act lo and behold an actual Timberwolf shows up. And not just any Timberwolf, but a friggin’ huge one! This time around, AJ does get herself stuck in some rocks (which is kind of silly given that earlier she had pushed over a rock ten times the size, but whatever), and it looks like she’s about to become a Timberwolf treat when Spike comes to save the day with a lucky heroic stone throw straight into the beast’s cellulose fiber-laden gullet. For all the crap I’ve given Spike thus far, this time around his actions were actually useful: he took care of that Timberwolf like nopony’s business, and while choking is certainly no laughing matter, the way that beast went down (“hold on guys, I’mma clear my throat here”) was pretty amusing. Of course, this whole situation wouldn’t have come around had Spike not been such a pest in the first place, but hey, in the end nopony died so that’s good. Both Spike and Applejack come to an agreement about sticking to their codes and generally not putting themselves in mortal danger in the first place, and once again everything is right in the magical land of Equestria. You know what? I had nothing but sour memories of this episode, and I was very much not looking forward to watching it again. But upon revisiting it with my “Spike squelch” knob turned up a bit more, I realized that I actually really enjoyed the way everypony else was written. They all very much stayed true to their characters: Twilight coming out of her extreme studying trance only due to a disturbance in the OCD-force (also known as an inkwell intentionally nudged a smidge out of place), Rarity absolutely not letting AJ get away with such an unpolished “damsel in distress” wail, and Pinkie being… yes, Pinkie (it’s totally not a cop-out if it’s totally accurate). Heck, once the idiot ball left Spike’s grip in the last couple minutes of the episode, even he wasn’t all that bad. Of course, I’d be remiss not to acknowledge the neat experiment of the cel-shaded 3D Timberwolves: they did kind of stick out visually (STICK out? HAH) in an odd sort of way, but they sure did look pretty sweet. So at the end of the day, I’ll chalk this episode up as an “unexpected turnaround.” Always great to find these from time to time! No Timberwolf-themed music came to mind whatsoever for this episode, so I went over to YouTube and clicked the first one I could find: Beware the Timberwolves by LeafRunner. I was expecting some sort of dark tense EDM, but instead got a highly enjoyable NES chiptune piece that shoots me back in time 20-some years and leaves a silly nostalgic grin plastered on my face. Brony musicians deliver once again! I‘ve described this episode to friends before as “Spike rolls Natural 1s for the majority of the episode before finally rolling a Natural 20″, and in the end I still think that’s the easiest way to describe what’s going on here. There’s sort of a common problem throughout most of the Spike-isodes, namely that most of them rely on Spike either holding tight to the idiot ball for most of them, or just being generally incompetent. This episode gets a bit carried away with the latter, to the extent that Spike is basically a walking disaster for almost the entirety of the run time. Which is kind of… odd? Considering that he’s worked as Twilight’s assistant for what’s implied to be his entire life, and a good handful of the things he’s utterly failing at in this episode are tasks that he’s seemed perfectly capable of in the past. He’s done housekeeping for Twilight quite a bit, and yet here he can’t mop the floors at Applejack’s or wash a dish at Rarity’s without making a much bigger mess than he started with. While most Spike episodes involve him creating his own problems through general buttitude, this one feels much more like he IS the problem, and simply being imposed on the other characters, and I’m really not sure how I feel about that. I’ve got mixed feelings about this one, as on the whole it is kind of contrived, but at the same time there’s a good few fun bits in it. Applejack planning out her questionably conceived scheme with the rest of the Mane 6 is easily my favorite part of this one (Pinkie claims the vast majority of the credit for why, of course), and there’s a handful of fun facial expressions used, but on the whole I’m kind of left grasping at straws for what to even talk about with this one. The plot is sort of a cookie cutter one that’s been used in quite a few children’s cartoons, and it’s not used badly here, but at the same time there’s not much done with it that breaks away from the norm. Spike’s Dragon Code as the modus for his insistence on servitude is a bit out of nowhere, but I tend to head-canon it away as something Spike just invented whole cloth for himself (his self-made business card is adorable and kind of seems to hint towards this), as this is the same character who envisions himself as a knight in his daydreams. Admittedly while that might explain his stubbornness on the issue, it doesn’t quite explain why Twilight seems to treat it as legit dragon culture (granted, she’s been shown to be largely ignorant on the subject of dragons before), and Dave Polsky answered a question about the subject on his Twitter at one point explaining that Spike had taken the initiative and done his own research since the last dragon-heavy episode, so… maybe not so much. I still don’t think it’s outside the realm of possibility that Spike may have goofed on his research or blown something way out of proportion just because it happened to fit his chivalrous fantasies. As for the Timberwolves… I loved being able to get a much better look at them than we did back in Family Appreciation Day. I really like their design, and the concept of the Timberwolf King forming out of the remains of three smaller ones is kind of neat. The fact that they’re the first noticeable use of CGI in the series was something that people made a big deal out of back when the episode first aired (it’s one of the major reasons typically given when people complain about this episode), but I don’t think they look particularly out of place. I didn’t catch that they were CGI on my first watchthrough, and while it was much more obvious to me this time around, I think that was only because I was actively looking for it this time. I do like the central idea of this episode, that Applejack saves Spike’s life and that he feels so indebted to her that he won’t leave her alone. That’s a fantastic hook that feels natural to the series, it’s great seeing the unconventional pairing of Spike and Applejack, and the Timberwolves (despite a few bits where the cell-shaded CGI doesn’t fully hold up) make for a great threat. 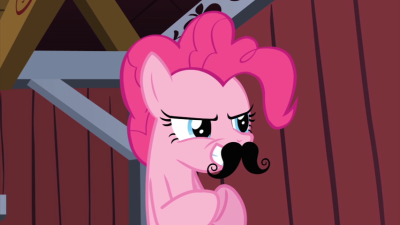 Also, Pinkie and the moustache is a cute bit. The problem is, in almost every single aspect of how Merriwether Williams chose to write the plot, it feels off and unnatural for these characters, and left me frustrated and confused for nearly the entirety of the episode. 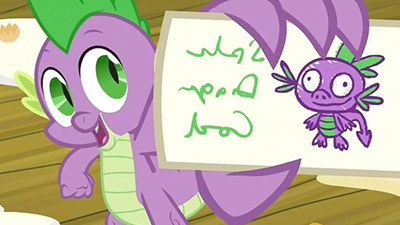 First of all, why is Spike so obsessed over a Dragon’s Code, especially when there’s a point in the episode where he pulls out a hand-scrawled card and specifically states that its his dragon’s code, not something actually bound to him by dragon culture. And even if it were such, why would Spike feel bound to it? We’ve had episodes entirely dedicated to how Spike dislikes dragon culture and rejects it. Remember how that one ended, with him openly declaring himself a pony? Yeah, the one we also took issue with. Regardless, that’s something they’ve established for Spike, and now he’s suddenly pulled a 180 and desperately clings to a tie to a people he doesn’t want to be a part of? No, you don’t get to just do that without some form of a transitional story in between. And why is he so inept? Yes, Spike has always been distracted, overly eager, immature, and goofishly reactionary. You know what he often isn’t? Bad at his job. He knows how to clean, how to organize, how to schedule, and yet suddenly he doesn’t know how to turn around without throwing an entire room in disarray? That’s… not Spike at all. 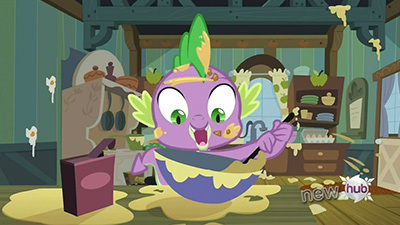 I’ll go with the awful pie he makes and his desperation to give a bite to Rarity, because we’ve established the wildly different diets between dragons and ponies, but all of the kitchen antics around the Apple farm feel out of place. And the episode is itself inconsistent as he IS pulling off seemingly impossible tasks! He built one heck of a rock tower! He counted every blade of grass! He made that pig sparkle! And when the third act came around, he saw right through the mock timberwolf they made. Merriwether is trying to have her cake and eat it too by showing how dedicated and capable he is while always putting countless buckets in his path merely so he can trip and spill them. This is poor writing. You know what would have felt much more in character? Yes, I’m donning my fanfic hat and pitching an AU for this episode. Deal with it. Imagine if Spike were so efficient, energetic, and dedicated that he’s getting everything done around the farm before Applejack can get to any of it, which ties to her need to keep working, to keep having tasks that she can do that firmly make her a central part of how this farm runs on a daily basis. It’s not that Spike is throwing it off, it’s that he’s making her feel useless because she has nothing to do anymore, and is taking away from her the role she has in both her family and livelihood. Imagine how threatening and compelling that would be to a character like Applejack, a character so against asking for help that she once ran away to another town over her shame of not being able to do something. But no, it’s just a string of gags resolved with a strung out gag. Like, why do timberwolves even Voltron together into a giant timberwolf? I’m down for having predatory animals literally made out of pieces of a scary patch of woods, but how does combining like this work? I’m confused. And what’s with the gag of Twilight being unable to pay attention to people talking to her unless one little element of her perfect world is nudged out of place? You know who put everything in place in that room to begin with? Spike! Spike is the one who lined up those ink pots and Spike would typically be the one to line them right back up when one is shifted! That’s who Spike is and what he does! That the episode doesn’t understand that very basic element is putting a severe strain on my exclamation key! I’m donning the fanfic AU hat again as I say, ok, Twilight wants a bit of a break from Spike and is happy to foist him upon the Apple clan for a bit. When we see her again, imagine the disarray she would be in without those extra hands to keep everything sorted and in order. He’s a key part of the machine of her daily existence, just as Applejack is to her farm. There. There’s your thematic tie to build an episode around. Keep the timberwolves bits, you’ve got a full plot. So, no, I don’t like this episode. High points: Timberwolves are real. I’d half thought that they might just be something that Granny Smith made up. I mean, not that I’d ever expect her to be anything less than truthful, but gol durn it I didn’t rightfully believe her. And it turns out that they can combine to form Devastator. That’s actually pretty cool. Pinkie Pie’s moustache. 1000% approved. Low points: LITERALLY EVERYTHING ELSE. Spike’s Bro Dragon Code. This is the very first time that it’s brought up at all, and it’s such a departure from everything we know about him. Walking that hyperbole back a little, he does tend to latch on to an idea and obsess over it (wonder where he picked that trait up), but Twilight treats it like something that’s been previously established. It seems like a false sense of chivalry that puts perception of personal honor before any sort of reasonable action, up to and including actually getting the permission of the person that he’s trying to help. Spike puts a higher value on his honor than on Applejack’s refusal of his assistance, and that rubs me the wrong way. Spike’s general incompetence. His time as Twilight’s assistant has given him organizational skills, cleaning skills, and especially clerical skills – none of them are on display. It’s being played up for laughs, but he’s so much better than he’s acting in this episode. It’s frustrating. Applejack tolerating Spike’s general incompetence. 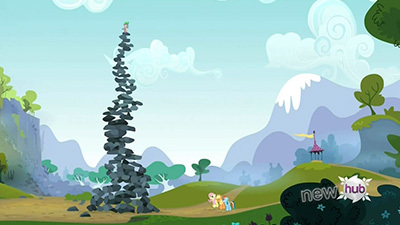 Normally, I don’t expect Applejack to put up with this sort of thing. Her code is very practical, very goal-oriented, and Spike is breaking more things than he’s fixing. She’s going along with it to protect Spike’s feelings, which is nice; but the net result is an extra helping of Chaos around the Apple Family Farm, which isn’t. No letter to Princess Celestia. This particular friendship lesson could use a specific denouement, and it doesn’t get one. In conclusion, I never expected a Wood-type monster to beat a Fire-type dragon.